Since it's back-to-school time here's a fun dish the kiddos will love. 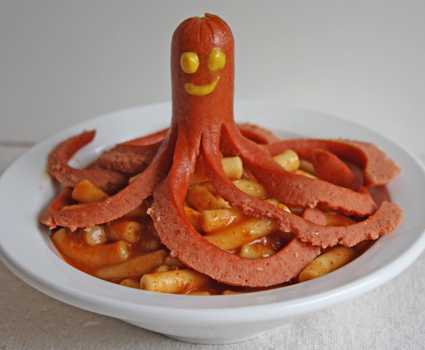 A hot dog octopus! Make him for lunch or an after-school snack. Prepare for giggles! 1. With a very sharp knife cut hot dog in half lengthwise, leaving about 2" intact at one end. This will be the octopus' head. 2. Carefully cut each of the long sections in half (lengthwise), then in half again - there will be the eight tentacles. 3. Boil the hot dog in water until the legs curl up and hot dog is cooked. 4. Remove hot dog from water. Dry him off a bit. 5. Place Mr. Octopus on top of a bowl of heated pasta arranging his legs nicely. Adorable!!! My kids are going to LOVE this!! !